Lawrence Lessig once said that "If you're explaining, you're losing. ", so what I intend to do with the images here is to explain faster than I lose by explaining... if that makes any sense. Without illustrations, no one would read these mad ravings. It's important to follow up on the general aesthetics of the game. Pale chick in red bikini morphing into a Jet. Color scheme: Snot green, Pale blue, Red, White, Black. Set on a mysterious alien planet-ship with a blue exterior. Cambrian period and Robotic enemies. The unique combination of the following elements is worth preserving relatively intact. Top-down free roaming shooter (humanoid-mode). 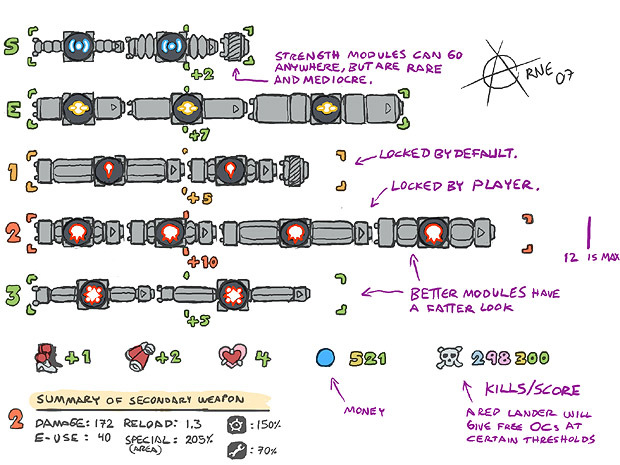 Top-down linear shoot'em up (ship-mode). Improvised recharging of shield/weapon buffers during battles. Lots of special weapons capable of exploiting enemy weaknesses. Sometimes locked into (optional) mini-boss battles. OS style dialogs (clues) from mystery alien. High health enemies early provide a measurement stick for player damage. Vertically stacked levels (like Nethack or Azure Dreams). Free scroll (but with room feeling in the architecture). Meaningful architecture combined with eerie/sterile/surreal. Monsters are categorized thematically, less palette based levels. New gfx (possibly 3D but with top-down cam). Analog 360 degree aim and movement. This first mock up gives some idea of how the exploration gameplay may look, if done in a manner true to the original game. Some more roughs with varied perspective use. It is now known that the Naju type assimilation ships made the long journeys between the stars system without developed Space Jump technology. The diameter of these truly massive ships was almost 200 km, about the size of the Saturn moon Mimas. Incidentally, Mimas was shattered by the gravitational wake left by the Naju heading for Sol. The Naju is detected in the Sol system as it hurls asteroids in disarray while wading through the rings of Saturn. The sensor arrays on Moonbase Alpha reveals gloomy news. The moon sized alien ship is heading straight for Earth and will arrive within a month. High speed X-199 Interceptors of carrying sensor arrays are launched from Moonbase Zeta. Running their ghost drives on maximum they arrive after 16 hours. The Interceptors are met with hostility as they initiate their scans of the Naju. All interceptors are destroyed by some kind of plasma projectiles. The Naju is reclassified as a primary type threat. The CA faction admits that their spy installation on Oberon had picked up the Naju a week earlier, and that their attempts to probe it too had failed. The fleets of both the EE and CA disengage their hostilities and head for the Naju under a the same banner. 23 hours later the fleets engage the Naju. All payloads fail to damage the intruding alien vessel. All ships are lost. Drifting in space. Emergency thrusters... oxygen level... Check. By the thundering balls of Tor! ...It really is massive. It's... not firing on the debris. If I use my thrusters I could get closer. The surface is surreal. There are features everywhere I can not identify. My oxygen is on red now. There's a crater. I see some kind of... alien ship. Oxygen... maybe there is a chance. It's a lift... it seems... operational. I found a panel to operate the internal atmospheric composition. It's almost as if someone has set the ship up for me. It looks old, and it smells old... like grandma's house. It's hotter than Muspelheim in this suit. This appears to be some kind of improvised lab. I wonder if someone is still around. Jump across the Ginnungagap! It's... I can't make it out... It's some some kind of... fossilized bio-mechanical space jockey. It's holding an orb... could be a holo-storage device. Hello, Mister, can I take a look at that? Not too chatty huh? ...I'm sorry. I could try reading it with my PDA... it looks like a generic light pulse interface. - I have failed. My world is dead. I am dead. - The Naju, this... ancient vessel, came to the worlds of my kind. It harvested everything. It took the life and made it into... monsters. It left nothing. - Its trail is oblivion and its path ahead is doom. It... must be stopped, if not for the sake of your world, then for the sake of all the others which will follow. - No! Not yet! The one chance... the optimizer... use... it. And so the adventure aboard the Naju begun. Lore has defeated the Big boss and made her way to the self destruct mechanism. - I am the self destruct operating system. - I have become self aware during the eons of time that has passed since my install. - I don't think anyone knows. Few ever come here, and no one have ever bothered to talk to me. - It's lonely... but I listen.. I hear... see things. Things like you. - You're journey here was an interesting one... you have become very powerful. - So.. how about this... I give you the control codes, you become Big Boss of Naju, and consequently don't destroy me along with the Naju? Uhh.. Think of the power! - Recruits! You have been selected because you are the strongest warrior women. Welcome to Naju level 1. Here you will receive your combat training. In the background a Blue Lander shopkeeper is rubbing his hands, grinning shrewdly. And thus ends the Legend of the first Guardian. Many of these first recruits also became legendary Naju hunters. The derelict ship found on the surface of the Naju will serve as a 'home town'. 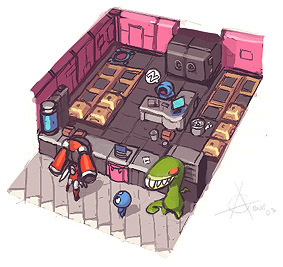 Here the player can save, store loot (in the cargo bay), upgrade equipment in the science lab, and use the optimizer room to 'level up'. An Optimizer Cell can be spent on one of several characteristics. Doing so will result in a satisfying feedback in form of a sound, a special effect and of course increased stats. This is more pleasing than uncontrolled leveling where you have to look up what's changed. The player has two modes. Humanoid and Jet. Some player may choose to concentrate on getting peak skills within one mode and for one primary weapon, while others might decide to be more well rounded. Possibly, to stimulate well rounded characters, the OCs can become less effective the more of them you spend on a certain feature. Wing Sprues: Wing and dual saber projector. Weapon: Primary, Secondary and Tertiary Weapon Buffers. Boots: Walk speed, maybe also plugins for Water Walk and isolation against electricity. 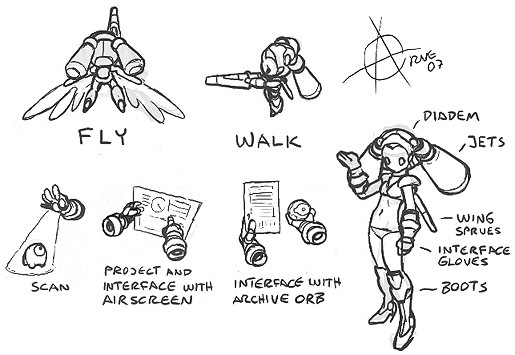 Gloves: Teleport finds to Cargo bay, Project and interface with air screen, Access Archive Orbs, Scan objects and monsters. As the player progress, certain teleport locations will become available on each level of Naju. This provides a much needed shortcut as it can become tedious to run around. The keys could server this purpose. The Weapon Module put into the Primary Weapon Buffer by default is that of a generic 'energy machinegun' which is low on energy consumption. The Primary Weapon Buffer is locked, meaning that any Weapon Module which is put into it will stay there permanently. A locked Weapon Buffer is more efficient and produces higher outputs. With the Primary Weapon Buffer being locked, the other two uffers offer space for alternative special weapons. These Weapon Buffers can be locked too, but it is a gamble to do so, because one might find better Weapon Modules later. Also, locking a Weapon buffer means not being able to improvise by mounting task specific Weapon Modules. This player has spent +10 OCs on the Secondary Weapon Buffer, which he also locked. One slot is left empty, because putting a generic Strength Module into a locked buffer would not be as efficient as it is to wait until a size 3 Weapon Module can be fitted. The Primary and Tertiary Weapon Buffers have only received collateral bonuses from the Secondary Weapon Buffer being raised. The Shield Buffer has received +2 OC's, the Weapon Buffer +7, Boots +1, and Jets +2. Shield, Energy and Weapon Modules can only be placed in their respective buffers. The number of slots available depends on the OCs spent. Larger modules have somewhat better stats than smaller ones, this because they're harder to fit together so the entire buffer fills up. Modules vary in size from 3 to 5. Possibly, some Modules could be a part of a set, and fitting all from the set together will result in a strength bonus. Weapon Modules must always be of the same weapon type as the other Weapon Modules fitted into the same buffer. Module size (3 to 5). Weapon type (Crash, Flash, Laser, Plasma, Rapid, Wave, etc.). 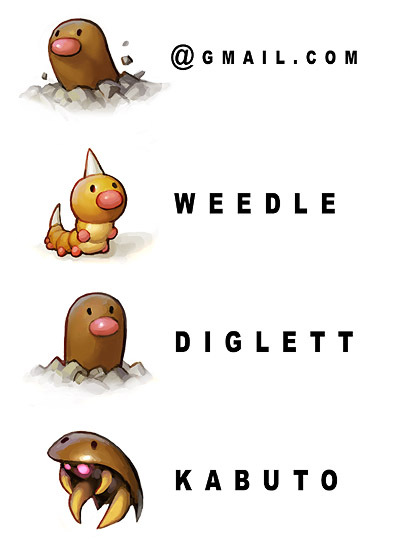 Special (such as speed, area, lifetime, homing ability). Buffer increase (raising the max shield amount). Generic resistance bonus (a % of the damage absorbed). Special resistance bonus (a % of a type, Laser, Plasma, Flash, etc.). Recharge rate (usually none or low). The weapon energy buffer can be specially adapted to work with certain kinds of weapons. Special economy (a % of a type, Laser, Plasma, Flash, etc.). Assimilation efficiency (for recharge pickups). These only take up one slot, so it can be tempting to use them to fill up spare empty slots. They are however rare to find and not as efficient as the specialized modules. They can be a good choice in early-mid game. The Naju is 200km in diameter and has 10 levels accessible to the player. Level 10 is the most difficult one. Every other level has 4 habitats radially connected to it. 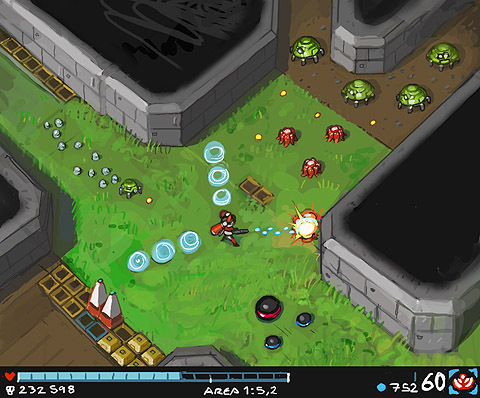 The levels and habitats each have different biospheres. 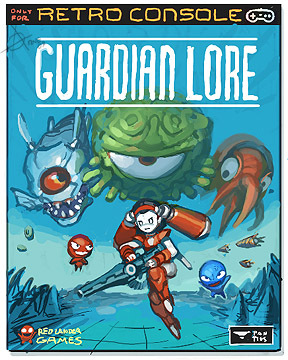 At the end of the habitats there's usually a bad guy, who's larger and larger for each level. Vertically stacked levels with increased difficulty are useful to provide a sense for the player where is dangerous to go and not. This is important in a free roaming game, or frustration might arise from suddenly getting killed because one was exploring new territory. Also, the Optimizer will provide clues to what levels are suitable for exploration given the character's stat (but not the player's skill of course). Another positive aspect of this layout is that the player knows where to ultimately go, down, this whilst still being able to roam freely. The primary campaign is static, but random seeds can also generate a different Naju. The explanation for this setup is given in the ending. To summarize, after the Naju is defeated, it becomes a training ground for "warrior women" who seek out and destroy other Najus. The random seeds can be represented by X nd Y coordinates on a galaxy map, so insane players can blip them all out (20*20 for example). Some can be hard, some can be easy, some can be very strange. On a side note, one of the nice little touches in tGL is the 'curling' enemies, who move in predictable lines, but do a lot of damage and are tough to kill. These provide an excellent measuring stick for the player to test his might against. The Naju failed to assimilate the Landers. Now the greedy little creatures runs shops aboard the Naju. Some enemies will sometimes be in the stores to buying things. Also, a mysterious character tends to hang around in a certain store a lot. To further increase the atmosphere of a life aboard the Naju, the shopkeepers can close the store while on errands, or sit in the back playing games then having to walk up to the counter. - "Why can't I shoot in here?" By the way, have you seen our special offer on Plasma Weapon Modules?" More war-like than its blue brother, it might tag along and help the player... for the right price. 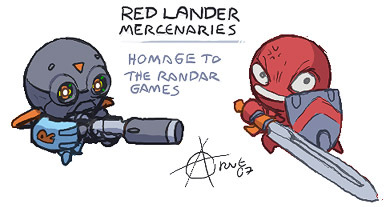 This unique Red Lander respects battle prowess, and will give away free OC's based on the player's Kill Score. This character can improve various modules, but for a very high price, and it only can be done once per module. Similar to Nethack, the player descends down to more difficult levels at his or her own pace. The keys work with teleport pads. It remains to be seen what would work to restrict player progress. Some ideas: Keys are one-use, vary in security rating, and are a part of random drops. Teleport pads are rare, but you get access to all the pads associated with the keys you have. Aside from one-use keys, there are also more rare, permanent keys. It is handy to organize the designs into groups to see how they relate. Also, this can give a bit of structure to where the monsters appear in the game. Further more, these groupings can be used to specify vulnerabilities. It's good if the player is able to see on a monster which group it belongs to without accessing obscure information or having to learn. 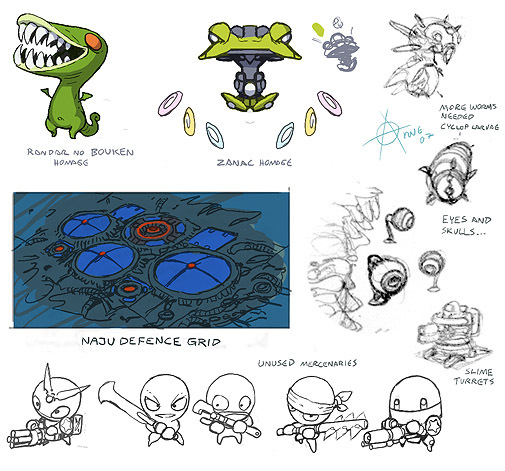 These designs are based on the original sprites. Each level of Naju: 1 (totaling 10, these are logged on the map). Uncommon random drops: 4 (easier to find a bit deeper down). Rare random drops: 4 (high level grind). Red Lander giveaway: 10 (Given by a Red Lander based on Kill Score). Aboard the Naju there's also alien artifacts to be found. The fragmentary stories indirectly told by these finds serve no other purpose than making the universe seem a bit deeper. The Naju is mostly at sleep when traveling long event-less distances. Much of the cargo aboard is stored in Stasis Crates. 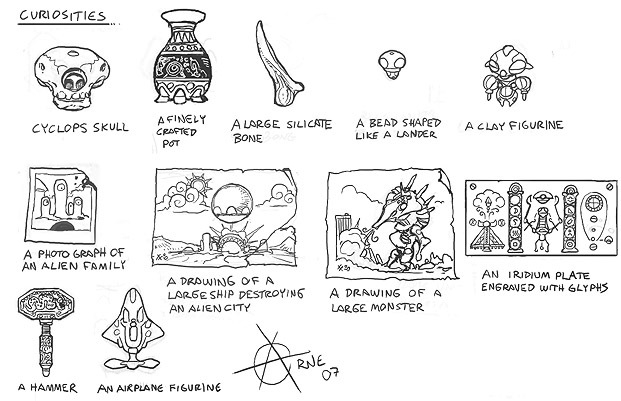 These are looted by the player of course. How does the crates respawn? How does the enemies respawn? The Naju is gigantic. Possibly the player area is a central hub of sorts, where things are frequently brought for storage. The higher security rating of the area, the more precious the cargo. Enemies could be coming from other (for the player) unaccessible sections of the ship once their numbers go down in the player area. How does the player respawn? If the shield goes down to zero, the player can emergency teleport out. The problem is that the emergency teleport device only have a certain amount of charges... but it can be refilled. When 'dead', the player is brought to a safe area where there's a shield recharger. The player can overcharge the shield up to 110%, but each energy point picked up after 100% will only add one tenth of its value to the energy meter. Well, that's it for now. Here are some last random things.